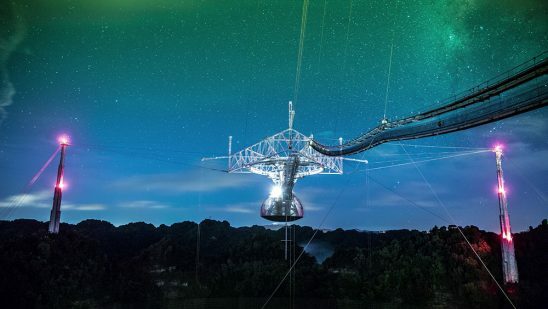 The National Science Foundation has awarded a team of scientists $5.8 million to design and mount a supersensitive antenna at the focal point of the Arecibo Observatory’s 1,000-foot-diameter dish, which is managed by the University of Central Florida (UCF). The antenna, called a phased-array feed, will increase the telescope’s observation capabilities 500 percent. One scientific objective of the new feed will be tracking new pulsars—especially millisecond pulsars that help signal the presence of gravitational waves. Such waves are produced by catastrophic events, such as two colliding black holes, and they cause ripples in the fabric of space-time. The phased-array feed will also search for extraterrestrial intelligence, detect fast radio bursts and conduct surveys to help unravel the mystery of dark matter in the universe. Arecibo, which was built in the 1960s, has been making headlines recently for its contributions to major space science news. It helped confirm gravitational waves and FRBs. Scientists from around the world use the facility’s powerful instruments to study everything from pulsars and dark matter to solar weather, and NASA uses it to study asteroids. UCF is leading the consortium that includes Universidad Metropolitana in Puerto Rico and Yang Enterprises Inc. based in Oviedo, Florida, in managing the NSF facility. The facility, which was damaged when Hurricane Maria hit Puerto Rico last year, opened quickly after the storm. Emergency repairs that needed immediate attention, such as patching roofs and repairing electrical feeds, have been underway since May after the site received hurricane-relief funding.